GTE General Manager Brenton Lewis and Chair Dr Julie Reis present $1000 cheque to Mayor Martin. GTE General Manager Brenton Lewis and Chair Julie Reis presented a $1000 donation to City of Mount Gambier Mayor Lynette Martin (left) for the Mount Gambier Community Mayor's Christmas Appeal. 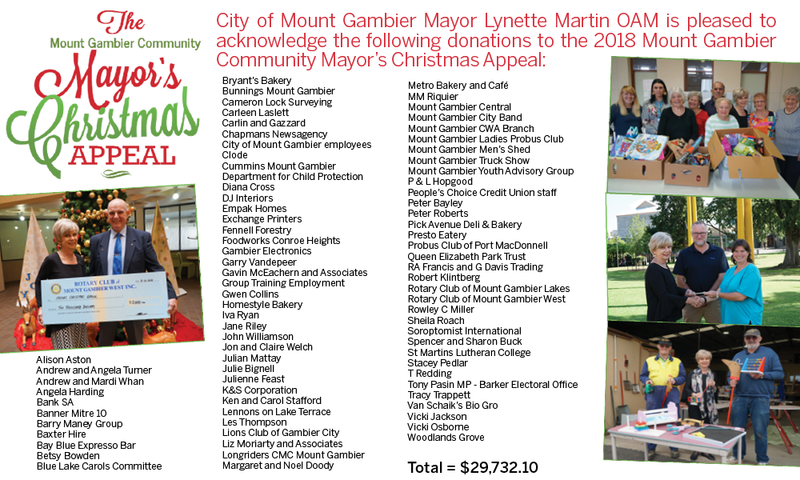 The local community dug deep to support those in need in 2018, raising $29,732.10 for the Mount Gambier Community Mayor’s Christmas Appeal, the highest amount in several years. City of Mount Gambier Mayor Lynette Martin is grateful for the support of generous donors who contributed to the appeal. “Now that we have collated the donations for 2018, I thank everyone who took the time to support the cause and think of the less fortunate in our community,” Mayor Martin said. The funds raised through the appeal are provided to local welfare agencies the Salvation Army, St Vincent de Paul Society, Uniting Care Mount Gambier, ac.care and Lifeline South East who distribute food hampers and other benefits to those who require a helping hand at Christmas. In 2018 the agencies assisted a total of 739 children, 670 adults and 454 families through the Christmas Cheer program and I thank them for their hard work. “I’d also like to recognise the ongoing support of Mount Gambier Central and the Men’s Shed for its donation of handmade toys,” Mayor Martin said. Local training and apprenticeship provider Group Training Employment made the final donation of $1000 to the 2018 appeal. “The GTE board feels that the appeal is such a wonderful thing for our community, it’s a pleasure to support it,” Group Training Employment Chair Julie Reis said. Call Council on (08) 8721 2555 (option 2) with your credit card details on hand. Council staff can email you a tax invoice straight away. In person at the City of Mount Gambier Customer Service counter - Civic Centre, 10 Watson Terrace. Send a cheque made out to 'City of Mount Gambier' PO Box 56 Mount Gambier SA 5290 with advice that the cheque is a donation to the Mayor's Christmas Appeal, to enable a tax invoice to be issued.